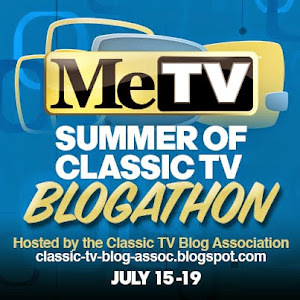 Welcome to The Horn Section's contribution to the Second Annual "Summer of MeTV Classic TV Blogathon", hosted by our friends at the Classic TV Blog Association! 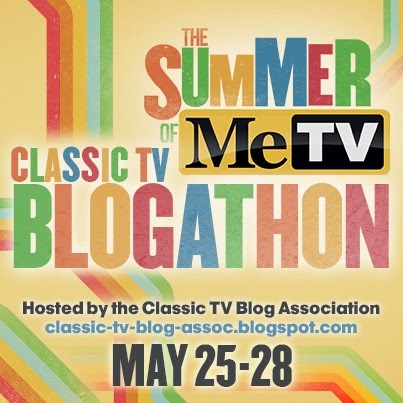 Go here to view all of the posts in this week's blogathon, which highlights classic television shows airing this summer on the MeTV schedule. 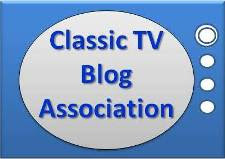 Click here to learn more about MeTV, and here to find a MeTV network affiliate in your area. 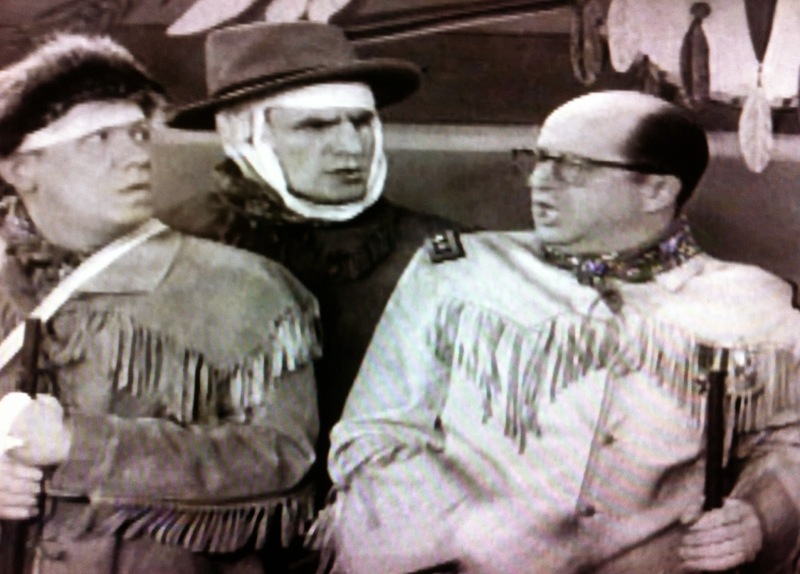 Since I already have an ongoing F TROOP Fridays series here at The Horn Section, I decided to write about another staple of MeTV's schedule: the key inspiration for F TROOP and the granddaddy of all service comedies, THE PHIL SILVERS SHOW. Besides, after covering CAR 54, WHERE ARE YOU? 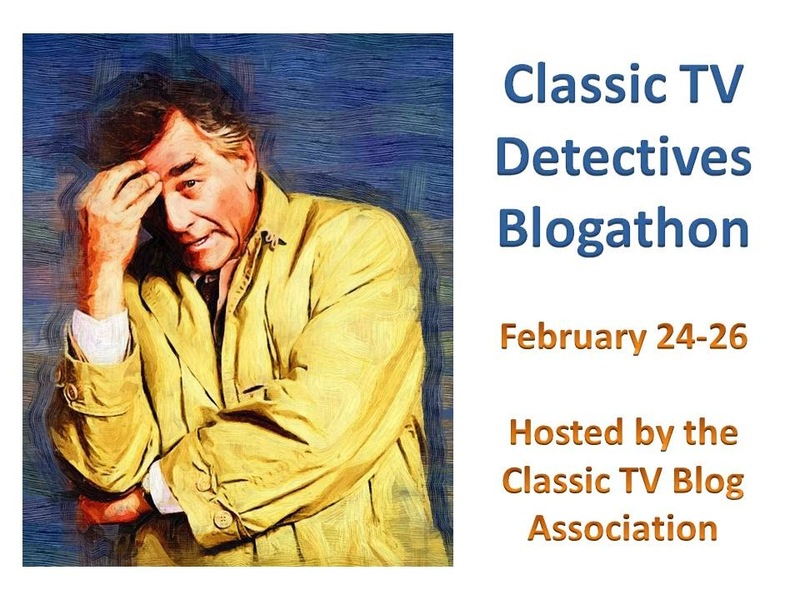 during the initial Me blogathon last summer, I really wanted to make a return trip to the twisted world of the great Nat Hiken. 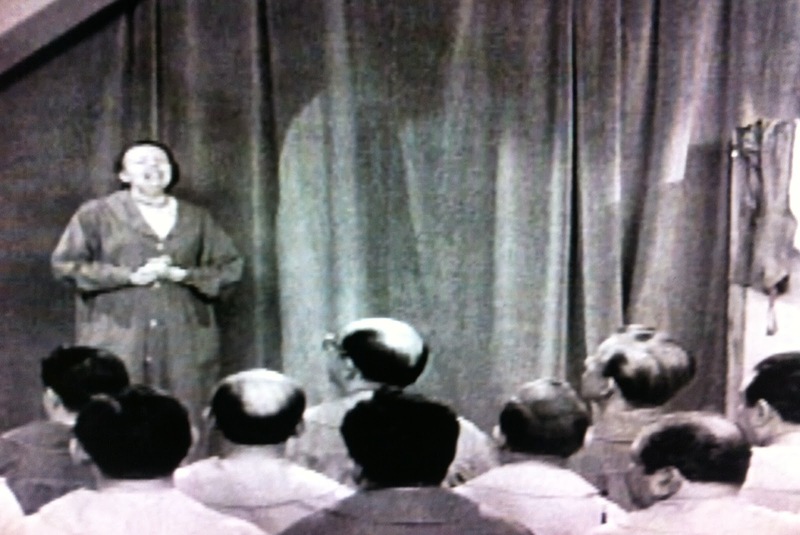 Without further ado, we take you to Season One of THE PHIL SILVERS SHOW. 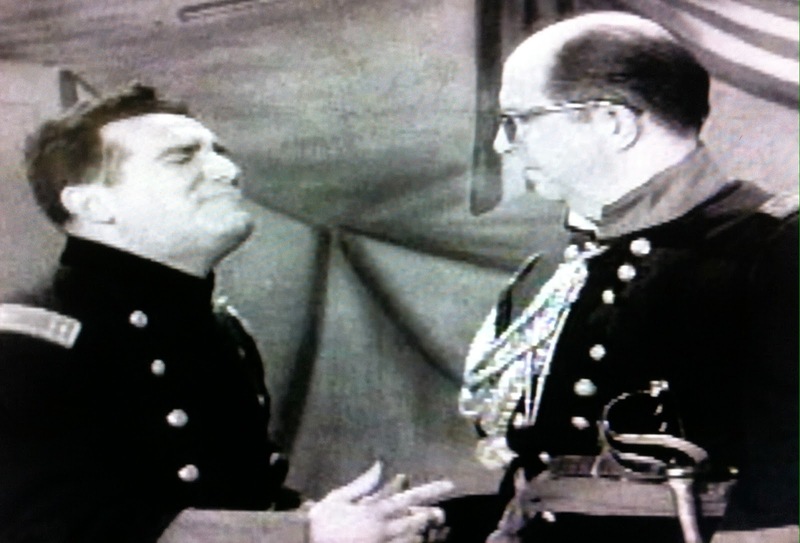 In today's highlighted show, a newly transferred Lieutenant vows to put a stop to all the gambling at Fort Baxter. 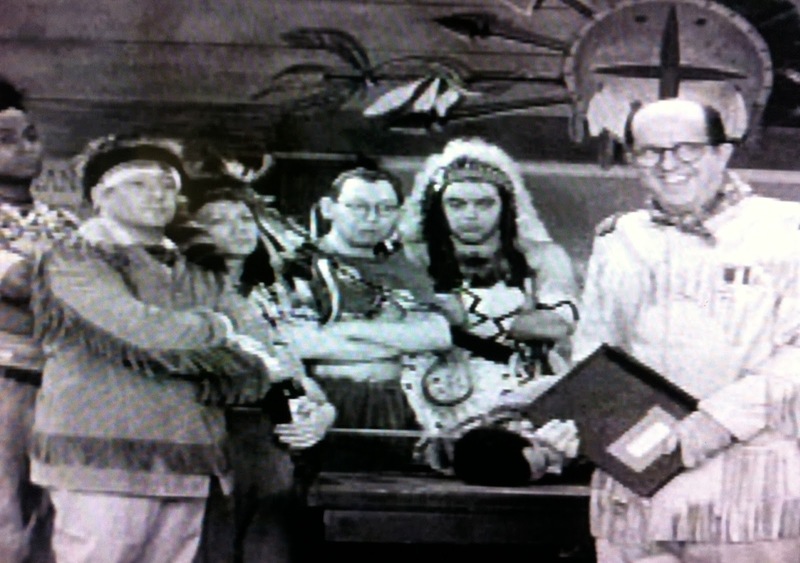 THE PHIL SILVERS SHOW - "The Centennial" (1955) Starring Phil Silvers, Harvey Lembeck, Paul Ford, Allan Melvin, Al Checco, Temple Texas, Maurice Gosfield, Billy Sands, Jack Healy, Maurice Brenner, Harry Clark, Paul Lukas, Herbie Faye, Mickey Freeman, Billie Allen, Jason Evers. Directed by Al de Caprio. Written by Nat Hiken, Terry Ryan and Barry E. Blitzer. 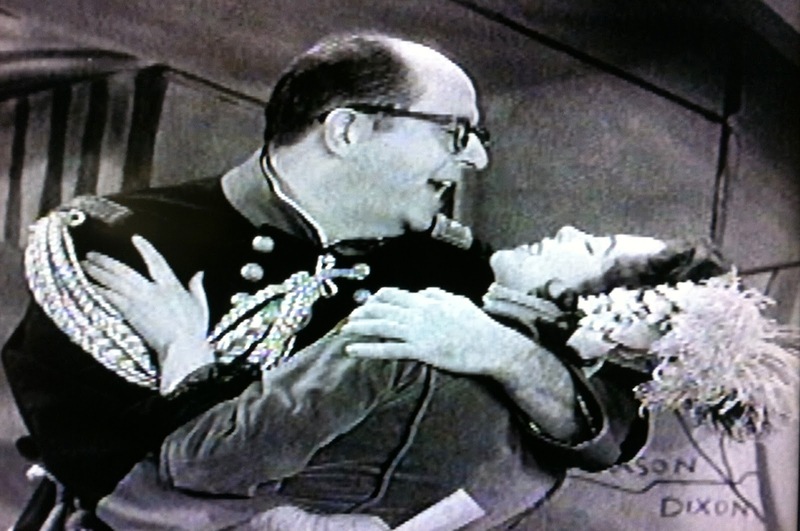 THE PHIL SILVERS SHOW was remarkably well-formed from the get-go, a meticulously written creation. By the second episode, "Empty Store", the formula was established: his C.O. 's or minions might win a battle here and there, but Ernest T. Bilko (Silvers) would always retain his unofficial fiefdom at Fort Baxter at the end of each installment, even if it was clear he'd "never get rich". Given how often it would occur over the show's 143 episodes, it is somewhat surprising to see that it took ten shows before Bilko's Emporium was threatened by an outside officer. 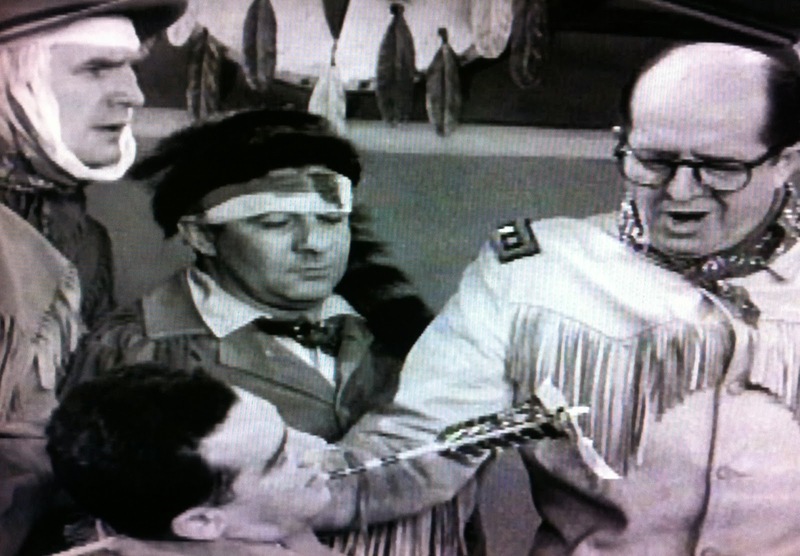 After all, F TROOP got right to this in its pilot a decade later. But Ernest T. only had an internal obstacle, Fort Baxter's own Colonel Hall (Ford). That is, until that tenth installment, "The Centennial". Lt. Parker (Checco, a quintessential "that guy" who is retired from acting but still with us at age 89) is moving into his new office at Fort Baxter, lamenting that he has been "transferred to a desert". An intellectual one, that is, lacking art and dance classes. 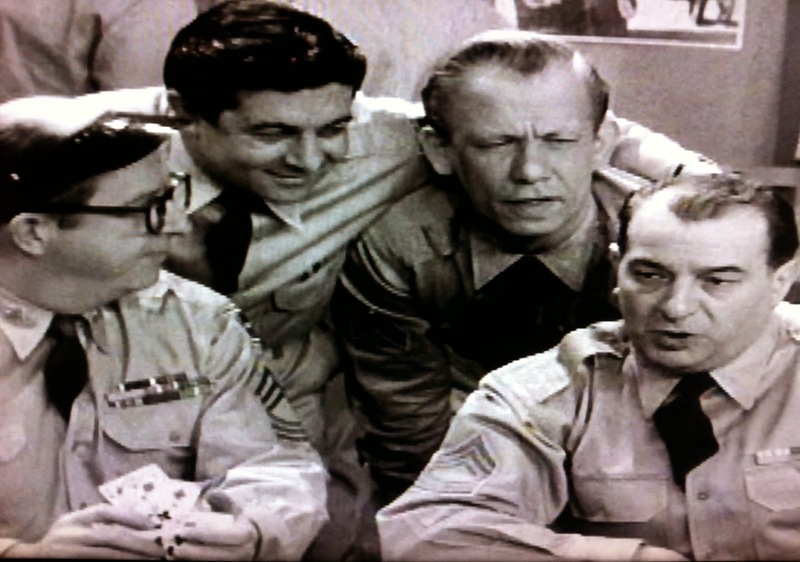 From the get go, Parker displays an air of superiority at the outpost, interrupting the Colonel twice and finishing the sentence for Hall when he tries to explain the interest of these "regular army men" of Company B: poker. "Usually led by one sharpster who organizes the game and takes his cut", Parker deduces. Right in unison with Colonel Hall, we assume he already knows Sgt. Bilko. But no, that introduction is yet to come. 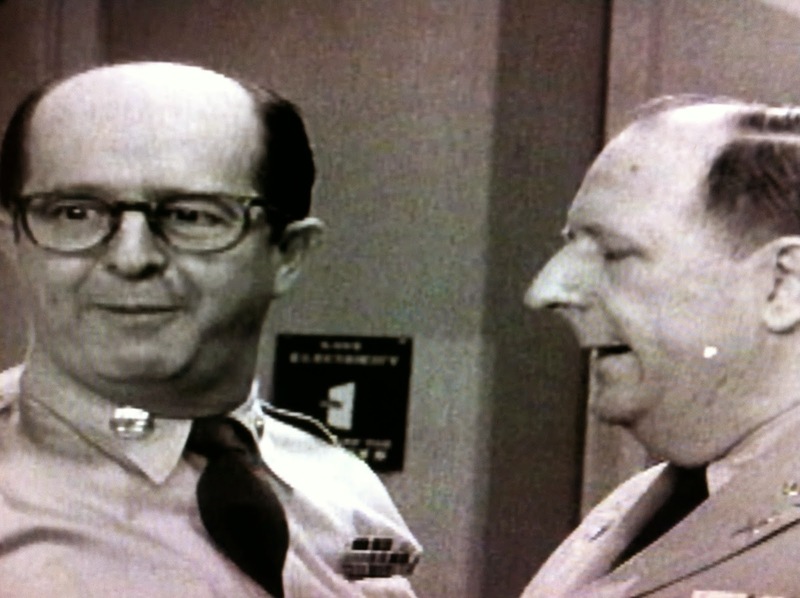 Meanwhile, Bilko is at the recreation center. As always, he has his visor on and is taking money from Mess Sergeant Stanley Sowicki (Clark). 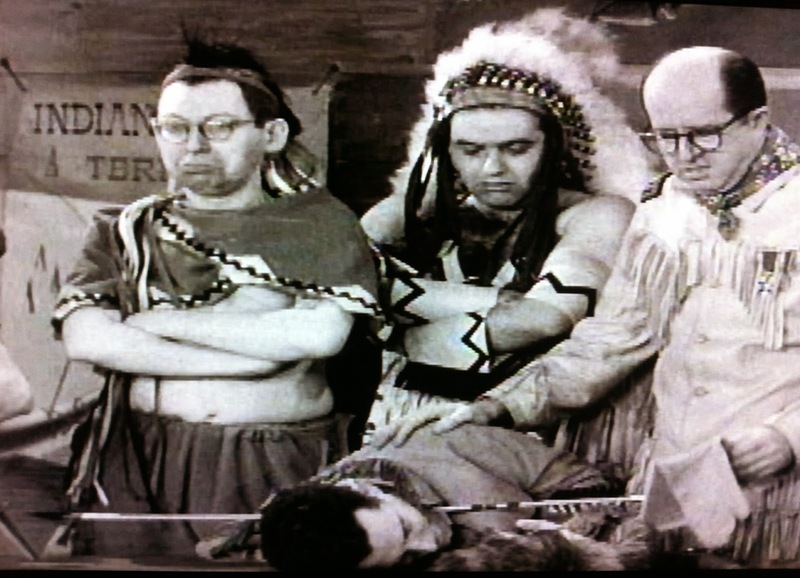 Sad sack Sowicki's pair of Aces is bested by Bilko's trip Kings, causing Stanley to lament his streak of bad luck, "now in it's twenty-fourth year". This being the first season, Joe E. Ross' memorable Rupert Ritzik has yet to arrive at Fort Baxter. 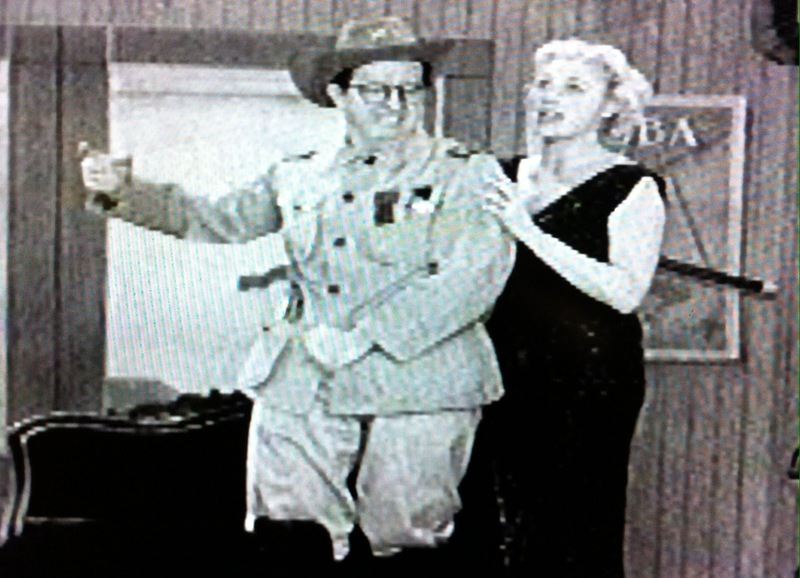 It was Clark's sudden, untimely death (he was only 46 when he suffered a fatal heart attack while exercising) in February 1956 that resulted in Ross' casting for the second season of BILKO. 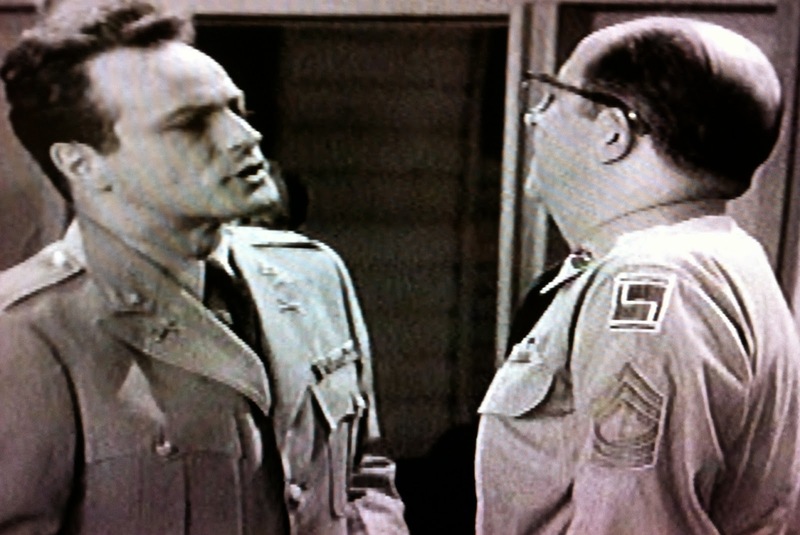 While Sowicki is by far his best known role today, Harry Clark co-starred in several Broadway successes in the 1940's and 1950's, including NO TIME FOR SERGEANTS, the one that brought him to Nat Hiken's attention. 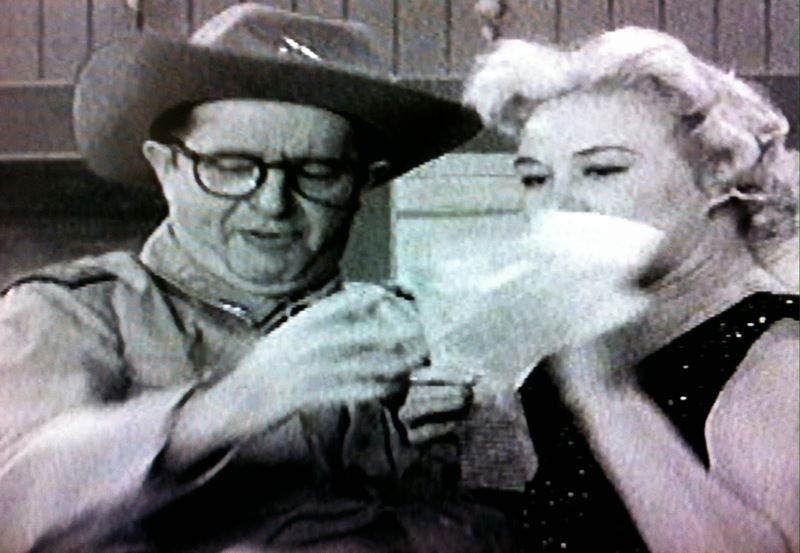 Bilko is forced to quit while he's ahead with Parker's arrival. 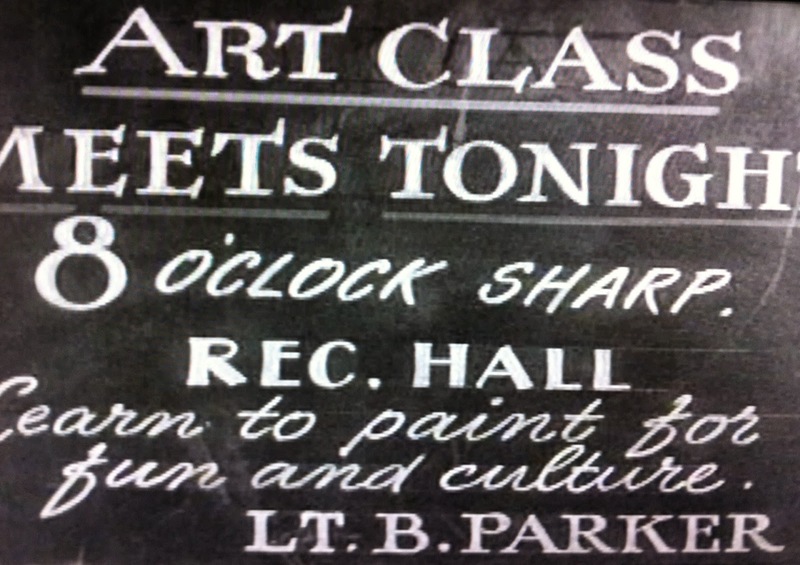 The Lieutenant is seeking interested students for the next night's Modern Art Class. Before he leaves, he reminds the men that there is "no poker allowed on the post" and takes the cards from the Ernie's hot, live hands. "Nice guy. We're going to miss him around here." 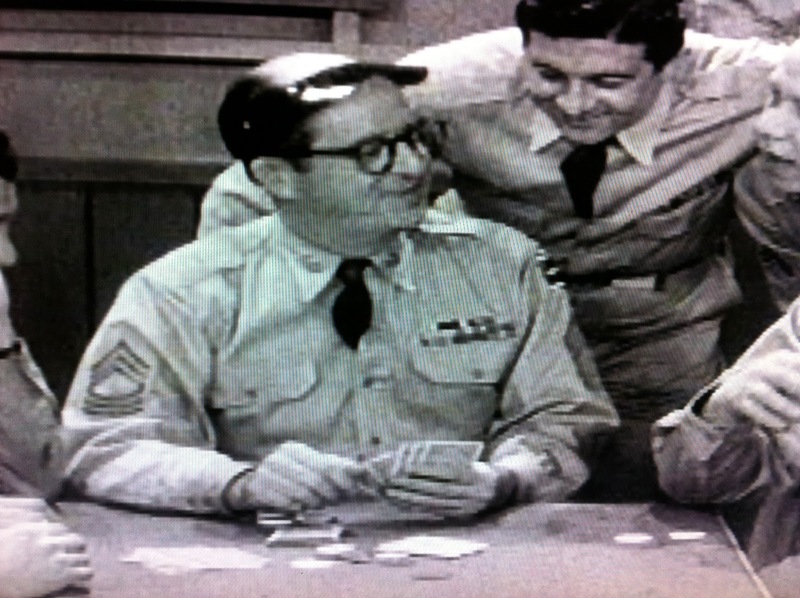 The card game temporarily suspended, Sergeant Bilko immediately begins organizing the pool on just how long it will be before they start missing him. 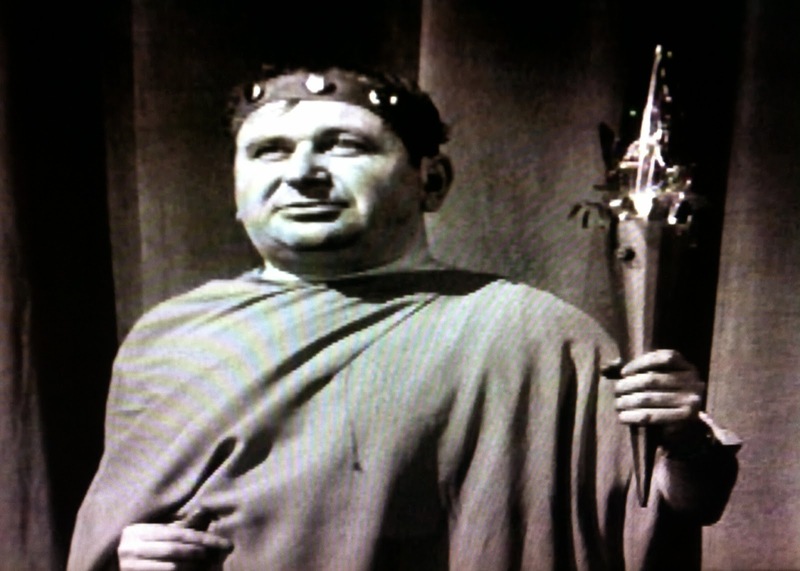 The new Lieutenant is likened by Doberman (Gosfield) to Lt. Zimmer, who lasted a month and had "nerves of steel" according to Bilko. The Sarge starts a pool, confidently predicting he'll have the new guy gone in two weeks, and from there, the dollar bills and guesses roll out quickly, with forecasts ranging from 5 days to three weeks. No one seems to think that this upstart Parker will make it the full month. That is, except the new Lieutenant himself, who reappears with a dollar to enter the pool! He doesn't venture a guess on how long before he leaves, though. Just a confident prognosis that "when I do leave, you'll be dancing, singing and painting. And I'll be happy!" On that note, and quite a smug expression, Parker exits. Five minutes before class, though, Parker's confidence appears misplaced, as the number of volunteers remains exactly zero. 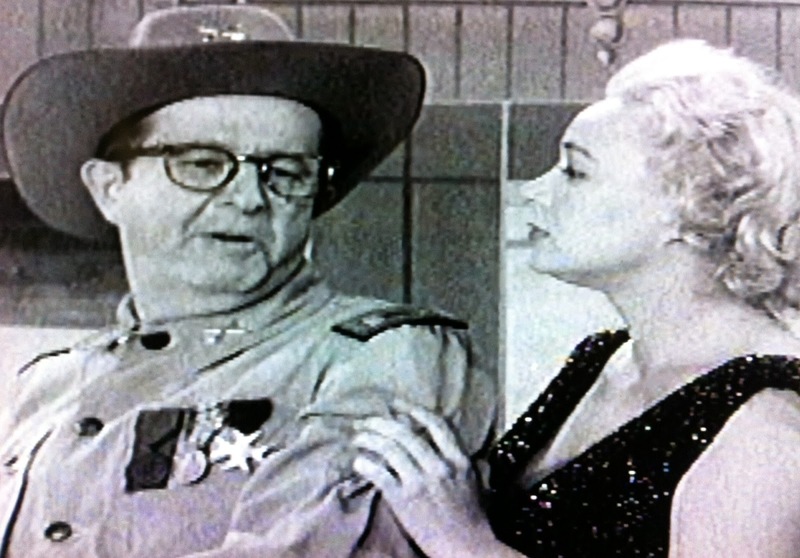 It appears that the Bilko Boycott is a smashing success--that is, until the model arrives: Miss Doozer (Texas). Temple Texas was not this southern blonde's real name. She changed it from Dora Jane Temple at the start of her modeling career. 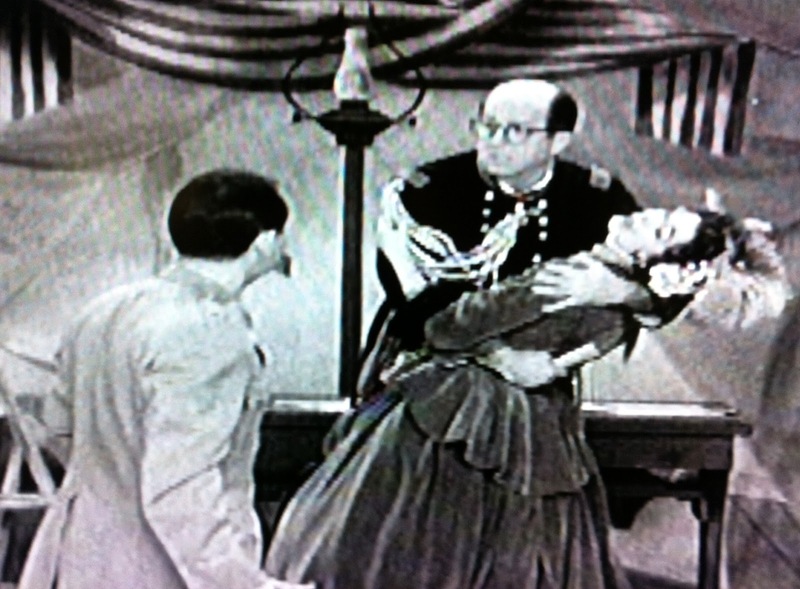 I found a 1949 newspaper article identifying her as "straight man" for Phil Silvers on TV, but this episode was the only TV acting credit I could find for her--a good one to be remembered for. 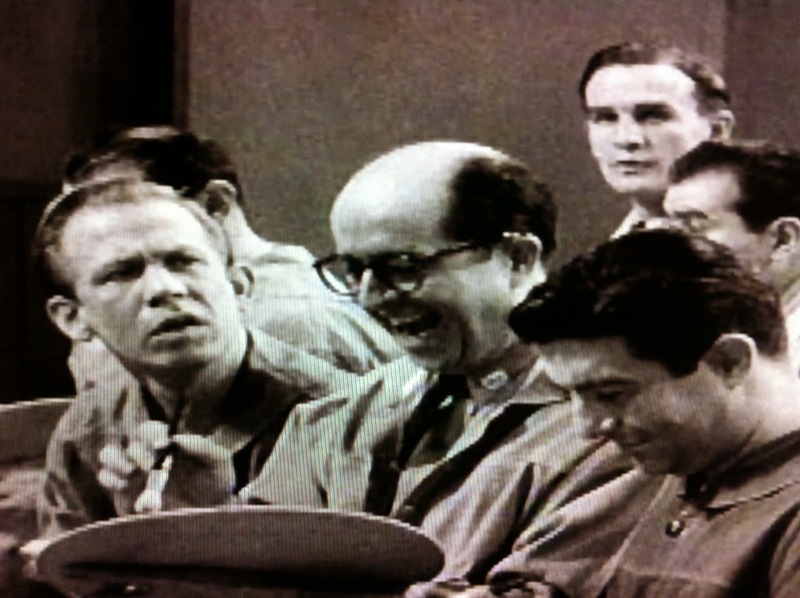 Also, it may take you a while to notice him, but to the left of the striking 6'0" blonde is Private Fleischmann (Brenner) making the first of his 131 BILKO appearances. 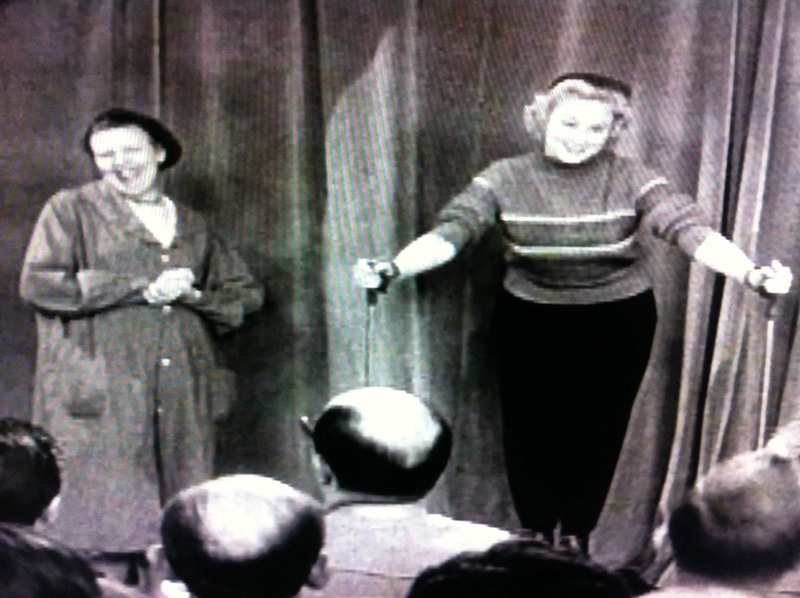 ...as Bilko's platoon has wavering attention during the introduction to class with each article of Miss Doozer's clothing that is visible--in unison, with Bilko's bald head leading the way. That gets a harsh reaction, and the situation doesn't improve for the men. Lt. Parker manages to create some major momentum with that initial blow, and the guys who had low numbers in the pool are already eliminated when we rejoin the class three weeks later. Bilko's armor has an additional crack since this already exceeds his prediction by a week. Night after night, arts, crafts and painting continues, and the boys are getting restless as Lt. Zimmer's thirty day record is increasingly in jeopardy. "Are we ever gonna have fun again, just playing cards??" 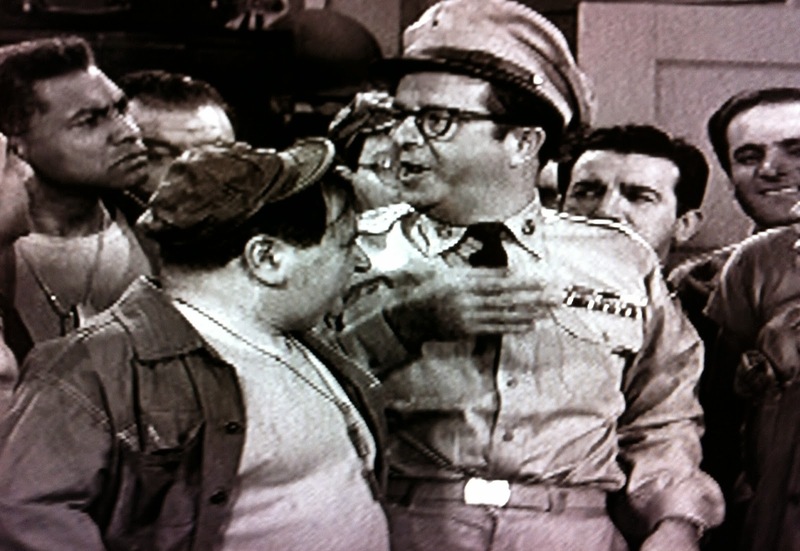 All eyes are on the Sarge for an answer, and has Bilko ever let the men down in these situations? "We're going to have a Centennial! Fort Baxter is suddenly one hundred years old!" It is at this point that Nat Hiken's much discussed genius for plotting (detailed in David Everitt's excellent bio, King of the Half Hour) reveals itself over the next two scenes. (More on this in a few paragraphs.) Almost disappointed, Corporal Henshaw (Melvin) replies, "you did that already!". Indeed, it's the plan that finally felled "Nerves of Steel" Zimmer after 30 days: a celebration centered on the only written history ever attempted on Fort Baxter. 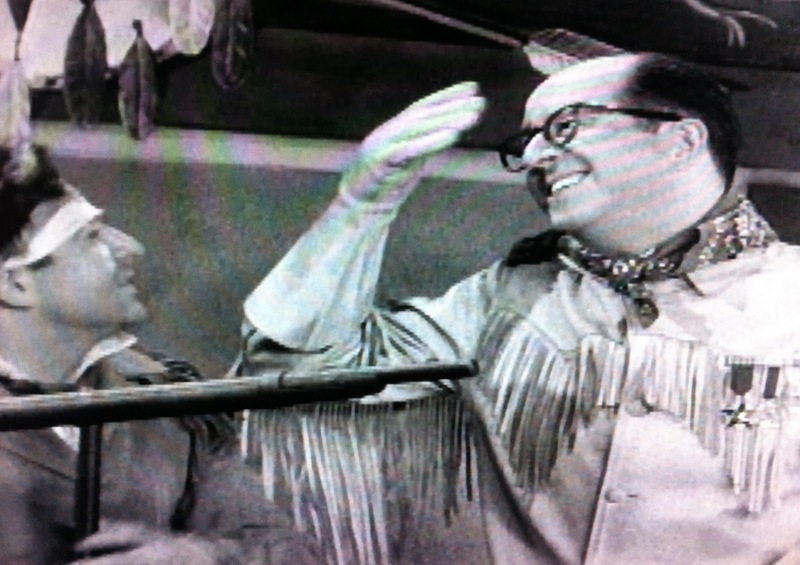 ...we can already tell that Bilko has found Parker's Achilles heel. 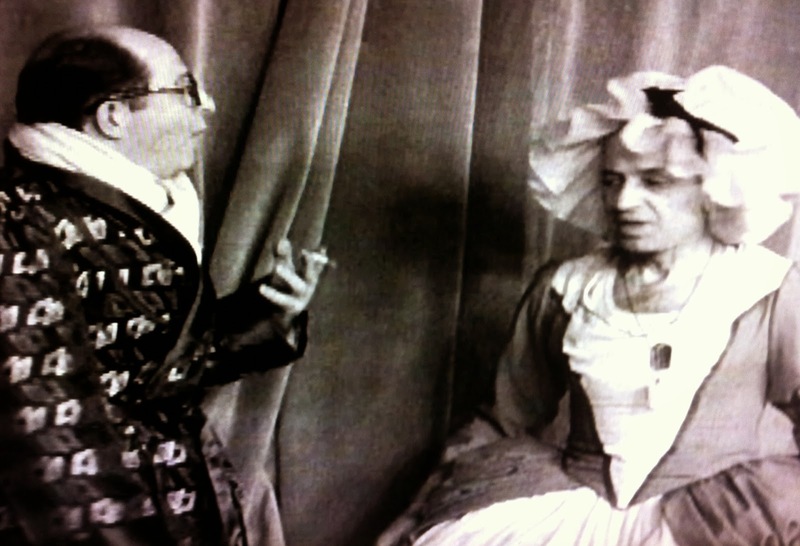 The idea of a pageant ("You've thought of it again, Sir!") to impress visiting Senators and Pentagon officials is irresistable. Parker decides to handle production and promotion, and places Sgt. Bilko in charge of staging and research. But just when it looks like we're off and running, Colonel Hall is within earshot, with that magic word "Centennial" bringing a hilarious reaction. "I thought you burned that book!" 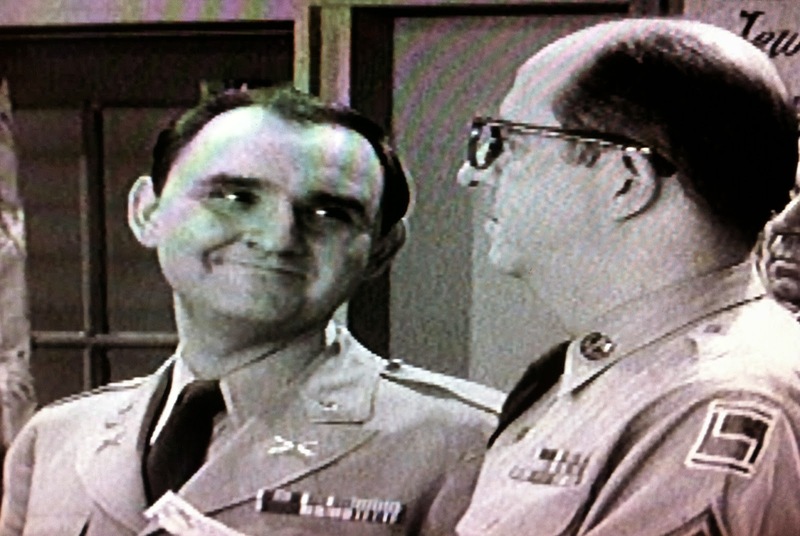 While Hall shames Bilko, the plan looks D.O.A. when Parker pokes his head back in the room. But the Lieutenant's tendency to interrupt stops Hall, and this last chance to apply the brakes. The Colonel can't get in a word edgewise before he's told there's nothing left for him to do at the pageant--furthermore, he'll be too busy. Lt. Parker has all sorts of plans for the Colonel and Mrs. Hall to host stimulating culture classes (Mandolin Club, Square Dancing, etc.) on the Colonel's former pinochle and bridge nights. 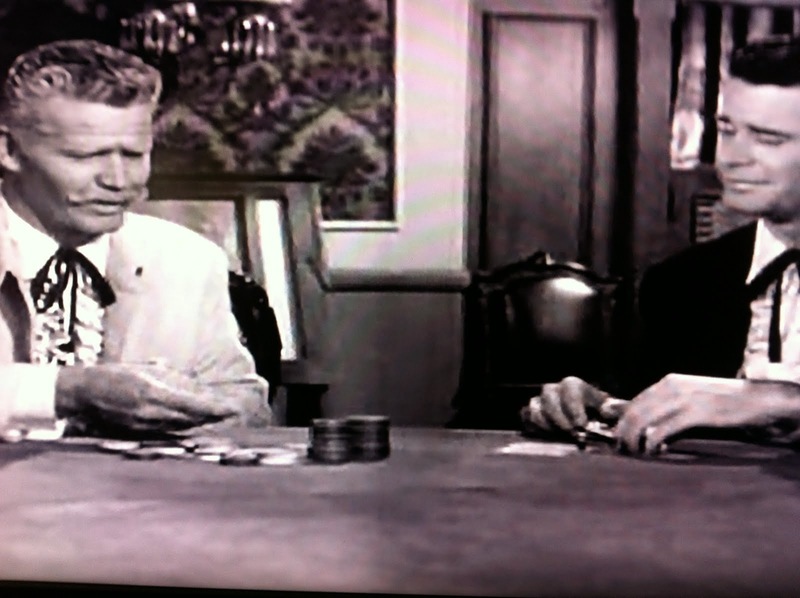 Parker: "Colonel, there'll be little time for card playing as long as I'm on the post!" 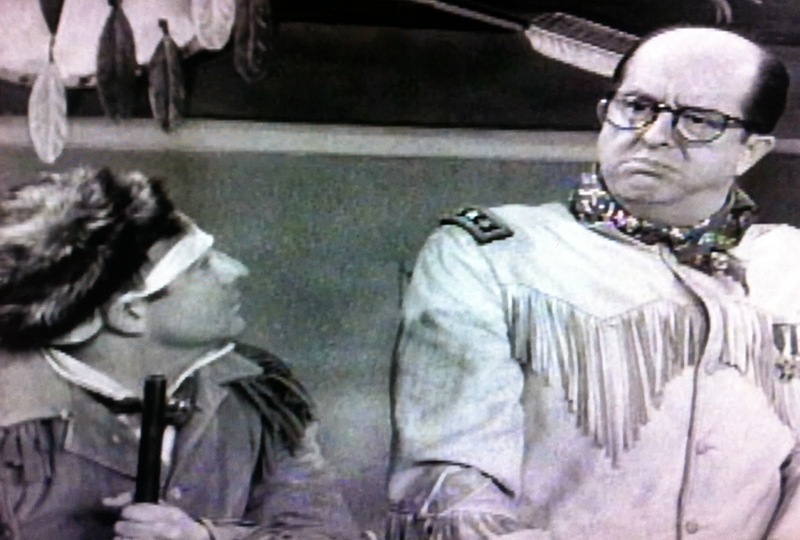 Bilko: "As long as he's on the post, Sir!" Clearly, two men not used to mutual celebration. 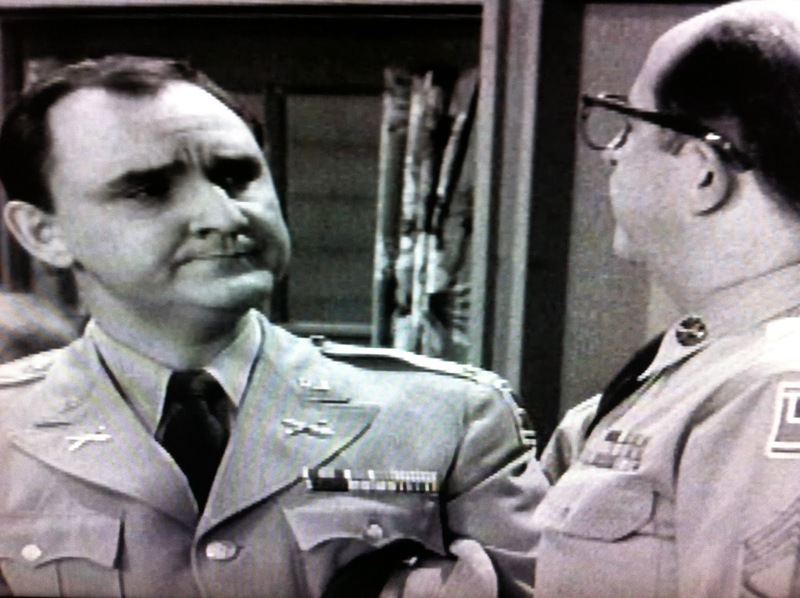 Now, about that genius for plotting I talked about earlier: BILKO might have been the same show every week in a way, but Hiken was incredibly creative at finding new ways to arrive at the same punchline. 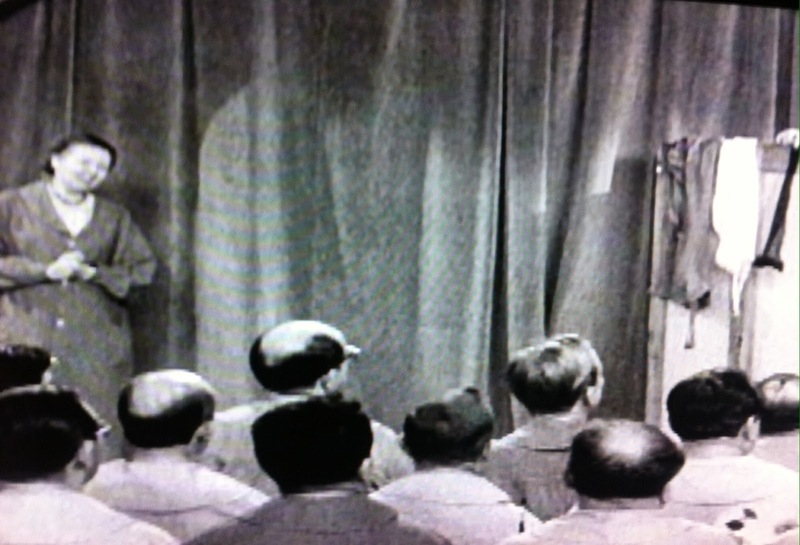 Usually, the audience is in on Bilko's scheme, watching and laughing at the scheme's target(s): Sowici, Hall, Grover, Ritzik et al. Now, after nine episodes of establishing our expectations, Hiken twists them. "The Centennial" puts us in the dark with an established, already executed plan that's very familiar to the participants--as well as to the erstwhile target, Colonel Hall. This time, though, Hall knows what's coming and we don't. Yep we're in the same boat as the Mark: Lieutenant Parker. Well, almost. We have been privy to a slow, steady drip of tidbits from Hiken and friends. First, the establishment of the "Zimmer standard", followed by Parker's leapfrog over it. Then, the same plan that worked on Parker's predecessor, which seems like a Hail Mary--until the details emerge, one at a time (the promise to "burn the book", it contains a "history best left forgotten", etc.). 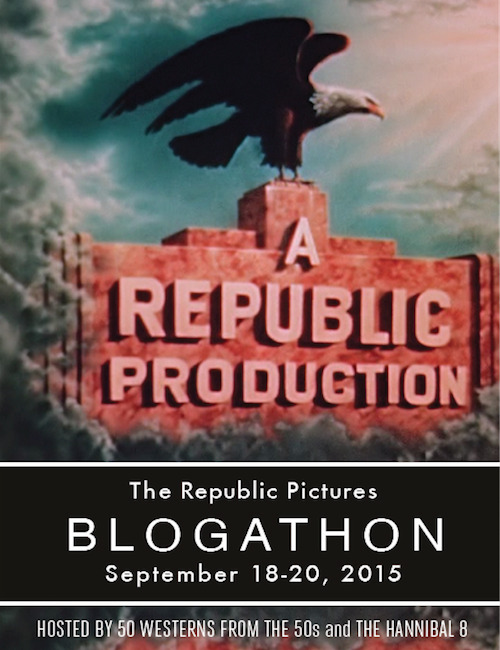 We've had several scenes of hype leading up to this pageant, and now it's time for the payoff. Actually, I can't do Maurice Gosfield's delivery justice by description, so one more short video clip follows. "Today, I am one hundred years old." Listen closely, and you'll hear a member of the studio audience respond with: "you look it, buddy". 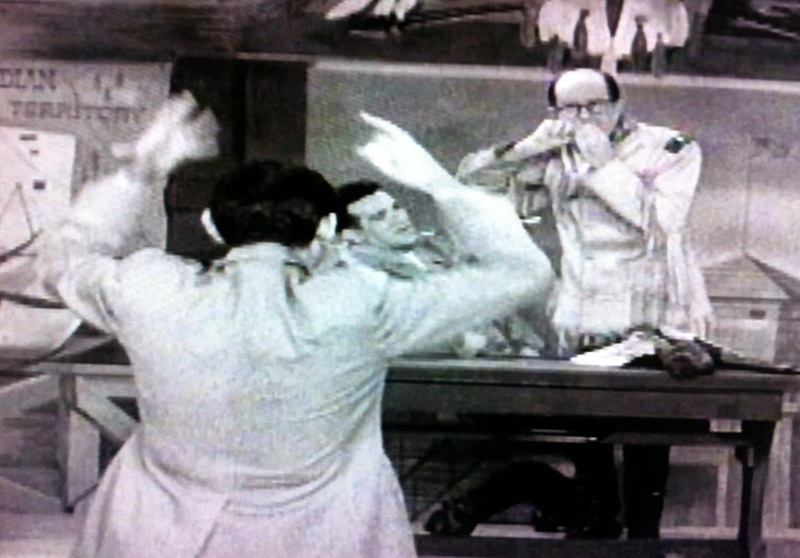 Trivia: Maurice Gosfield briefly teamed with fellow "slob" Joe E. Ross for a duo act, which (thanks in large part to both shows airing on CBS) made it to Ed Sullivan's Show for one 1958 appearance! Unfortunately for them, that meant that they were seen coast to coast, thus ending this comedy team. 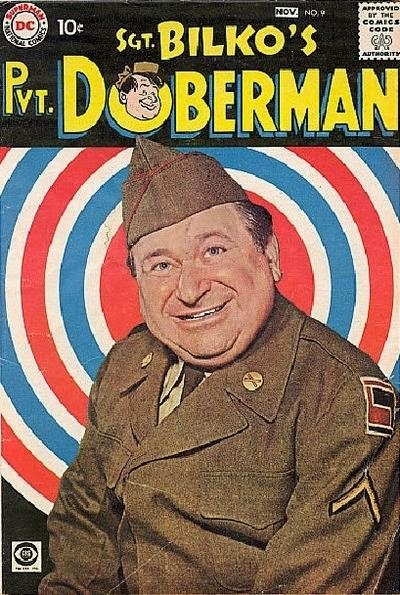 Nevertheless, despite his decidedly non-professional standing as an actor, Gosfield enjoyed great celebrity during the show's run, with Private Doberman even getting his own comic book! Truth puts more zip into his lines than Doberman--who wouldn't? "Too long have my lips been sealed!" It's time to unseal them, and to present a Centennial Pageant in Three Acts. Act One is behind that drape, and we're about to meet our first hero: General "Indian Bill" Baxter, played by you know who. To be kind, the pageant is still ragged. Cue after cue is missed: the Curtain of Time isn't pulled aside in a timely manner, and those tom-toms that are driving General Baxter mad stop when they should start, and vice-versa. 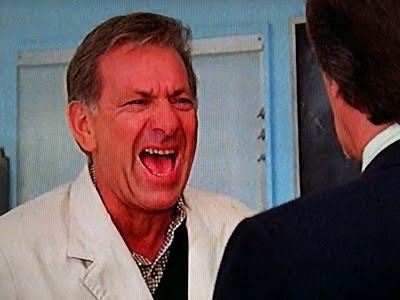 On the plus side: we have the time tested hilarity of intentionally bad acting from good actors. 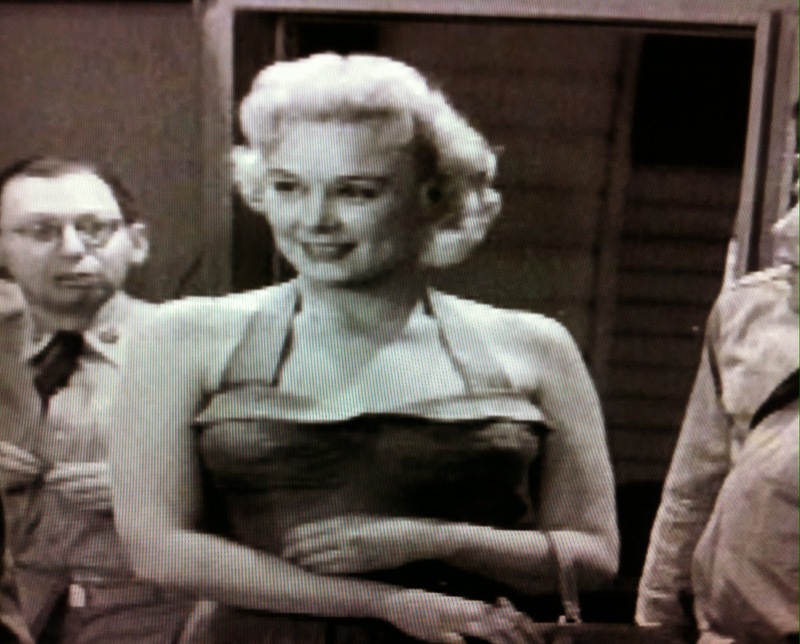 And, conveniently enough, all of the pageant's performers are cast from Sgt. Bilko's motor pool. 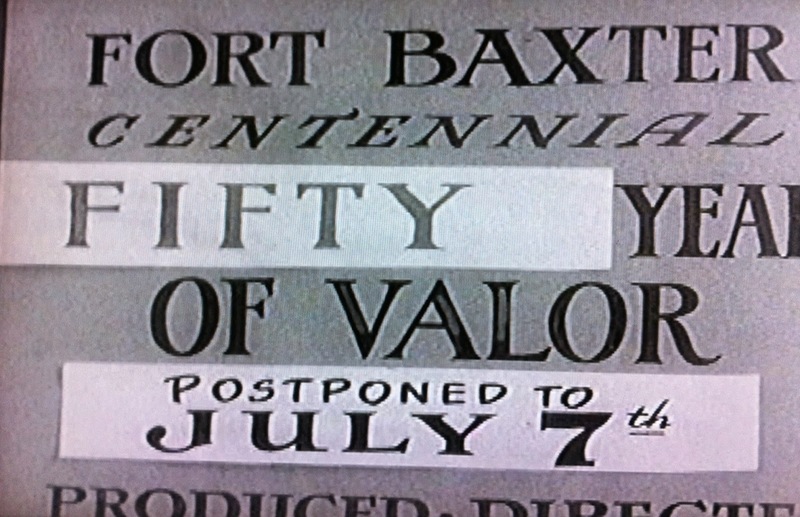 One Hundred Years of Valor opens with General Baxter and his men, inside the Fort, surrounded, hopelessly outnumbered by Indians, and starving. 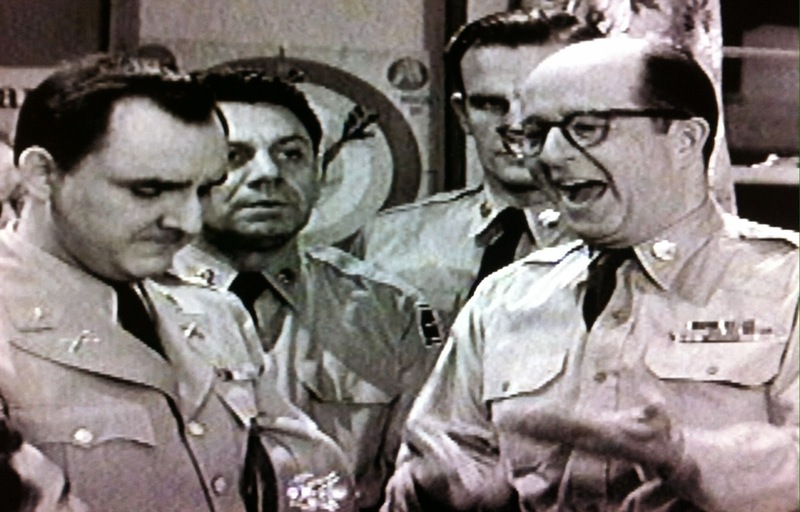 Kadowski (Lukas), the lone Private onstage with Bilko and his Corporals, sums it up woodenly. "We are in no condition to fight!" Never underestimate the motivational skills of a Great Hero. 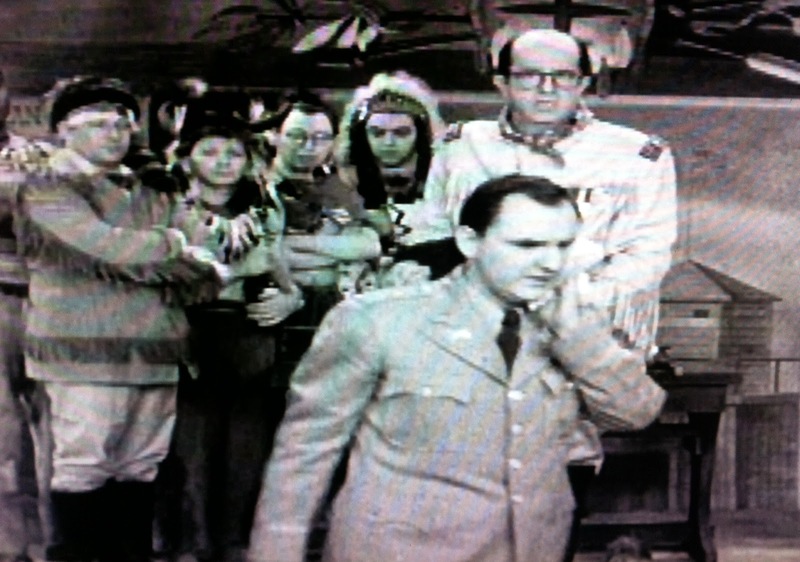 General Baxter, incensed by reports that the Indians are obtaining liquor, won't hear of it. "Surrender, never!" Despite endless war whoops and tom-toms, he rallies his men, reminding them that the Chief must be captured and interrogated until he talks. (Hopefully, waterboarding wasn't around then.) 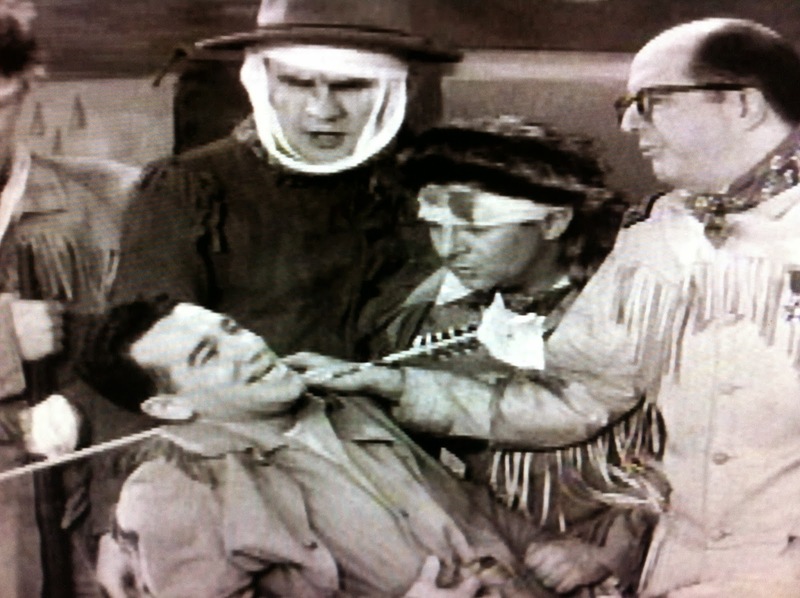 "Are you going to let a broken arm and some poison arrows stop you from bringing in Chief Tallfeather?" His underlings sufficiently worked into a frenzy, the General gives them an emotional sendoff. "How my heart aches that I can't go with ya'll!" Turns out that the General's recurring sinus problem is much more powerful than fractures or toxins. Enough to sideline even the most skilled motivator. Strangely enough, upon hearing this Baxter's men suddenly lose their attack mojo. But before the insubordination can commence, their advance scout Corporal Jolleson returns with a note--and a fairly serious looking injury. It only hurts when you laugh, Billy! But he does, with a wonderfully delivered: "General! Pull out the arrow!" Which he has to repeat several times as the General first moves him over (so the "blood won't drip on the table") and then starts holding him up as an example of bravery to the men. He has a medal coming! 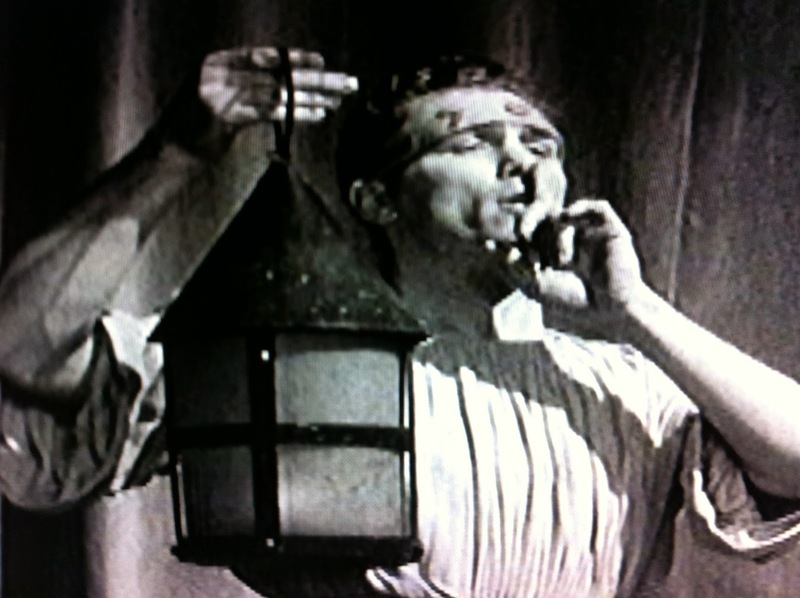 Probably posthumously, but in the meantime, Jolleson has one thing on his mind: "General, pull out the arrow!" But the note must be read first. It's from the Chief, challenging Fort Baxter's finest to "come and get us". It appears to be this, and not the mortally injured Corporal, that inspires the men to charge out. Sadly, the General is next to be wounded, getting a sliver as he attempts to "pull out the arrow". General: (to the Corporal) Quick! Run to the infirmary and get me a bandage! Corporal Jolleson: But I'll never make it!!! General: (shrugs) Well, see how far you can get. And this finally compels Lieutenant Parker to stop the scene. I know---after all that, it's the sliver that has him questioning the General's heroism. 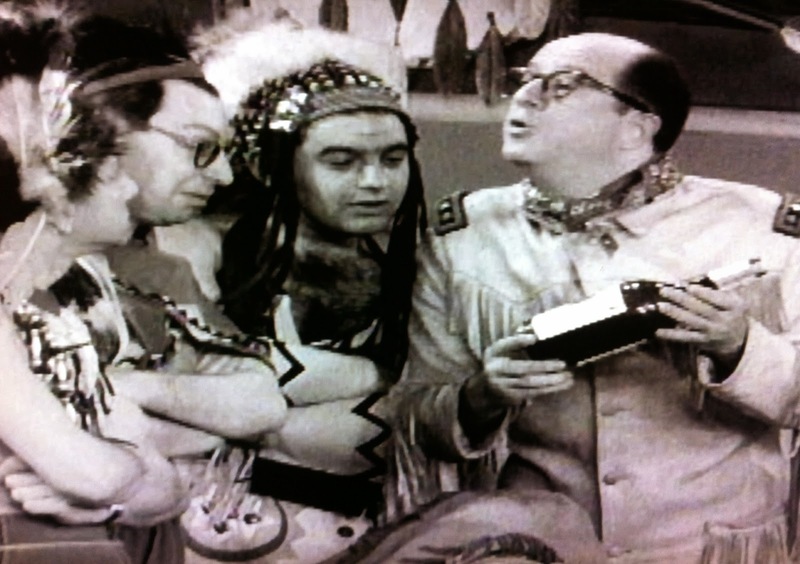 Bilko quickly explains that Indian Bill was known for pretending to be wounded as a battle trick, once causing an entire tribe to "get careless and drunk". Truth? Maybe, but not during this battle. 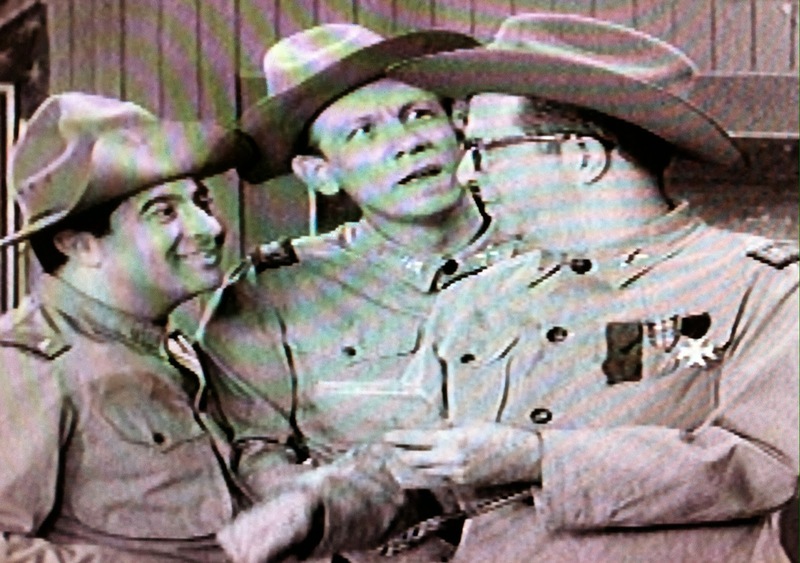 Still, Bilko's assurance is enough to placate Parker so the rehearsal can continue. The attack succeeds, but at a terrible price--Indian Bill's trusted assistants are among the casualties. Nevertheless, the Chief has been captured. 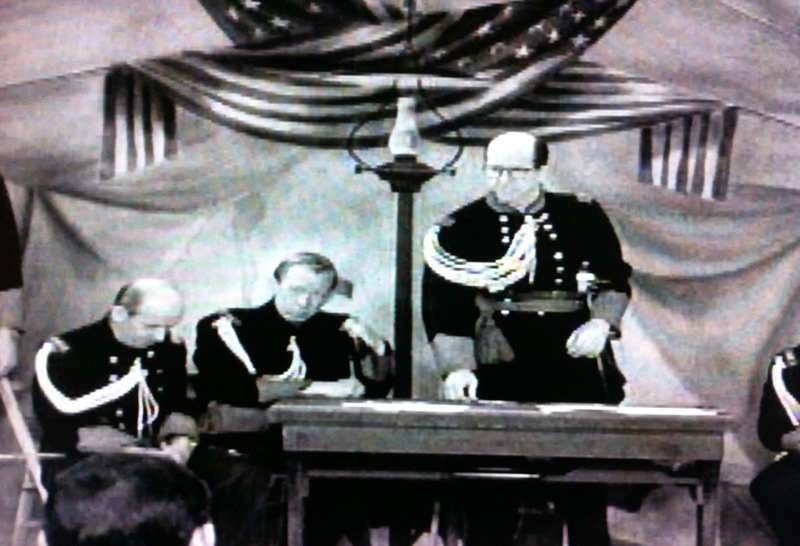 With Jolleson finally succumbing to his wound ("General, pull out the----"), General Baxter vigorously starts the interrogation, so that their deaths will not "be in vain". "Who's been selling you that whiskey??" 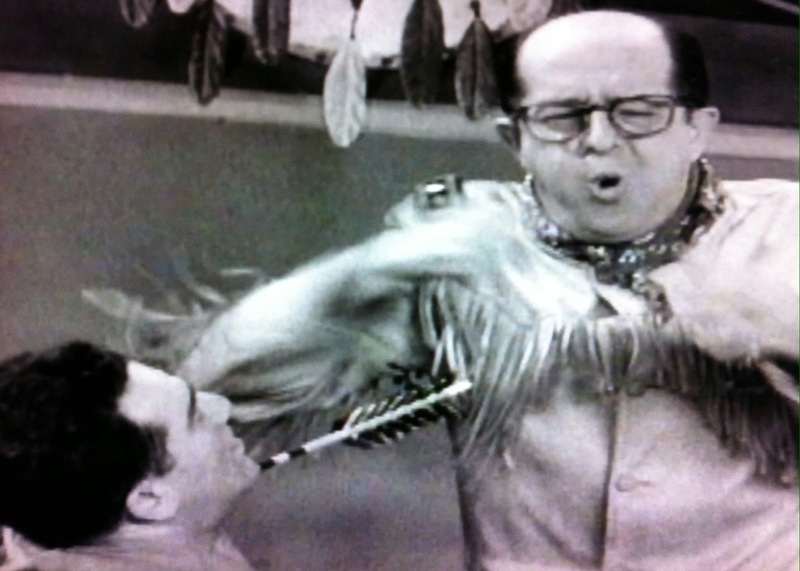 Chief Tallfeather refuses to snitch on the source of the liquor, even after face slaps and name calling. Finally, Baxter relents. "Well, it doesn't matter. 'Cause from now on, you're gonna be buying the whiskey from me!" If you guessed this revelation would be another show stopper, you're right. 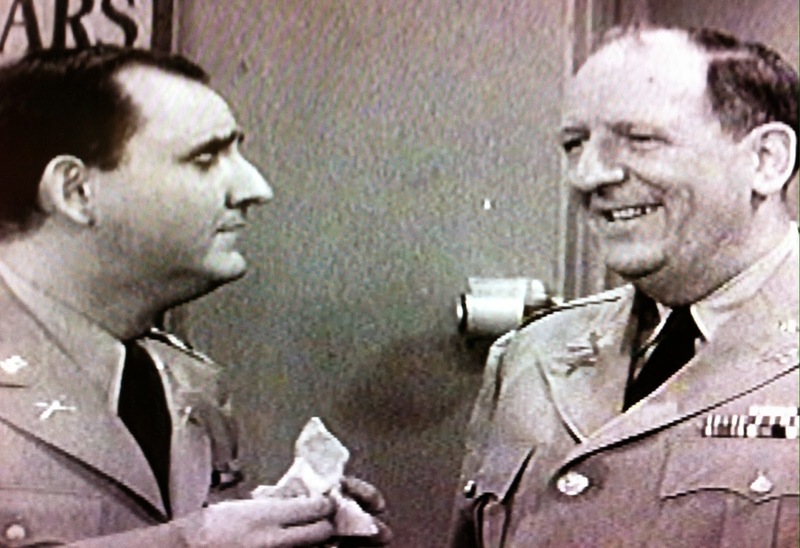 Bilko again reassures the frantic Parker that it turned out all right. 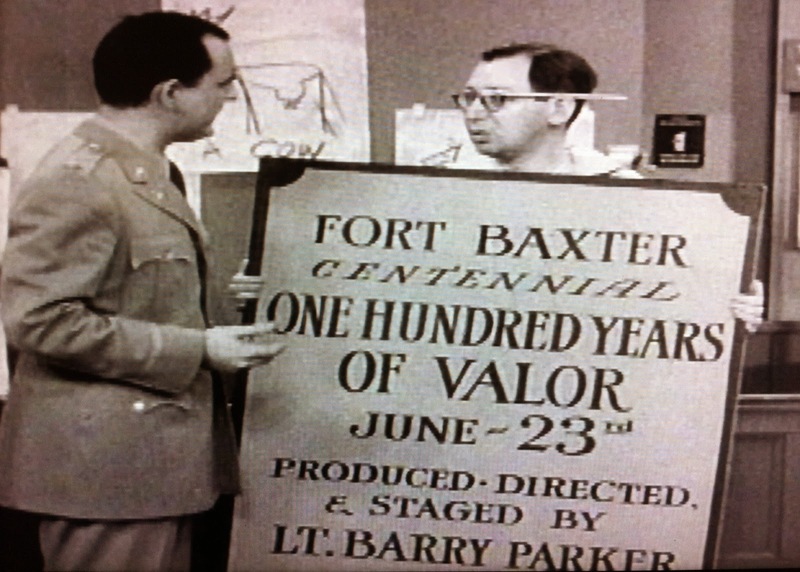 "General Baxter was caught, dishonorably discharged and sentenced to thirty years in federal prison!" 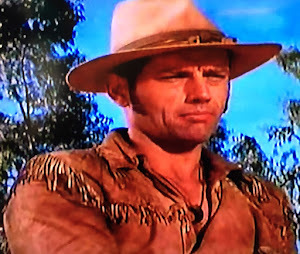 Besides, the General's sad end just "leads into the next episode": Civil War hero Colonel "Honest John" Otis, who "let neither friendship nor love stand in the way of duty"! Nevertheless, Lt. Parker doesn't want to leave this first act in. Interested in learning more about Colonel Otis, he decides to "start the pageant from there". Nagging Question # 2: Wouldn't the Fort have been renamed after the General's disgraceful end? How is it still named Fort Baxter? And Parker once more leaves the pageant in Bilko's trusted hands (for some reason), albeit with a changed expression as he exits. "A little rewriting" is the reason given to the Pentagon for the postponement. Parker has less pep in his step than before, and I really couldn't see that his name had been made any more prominent on the poster. 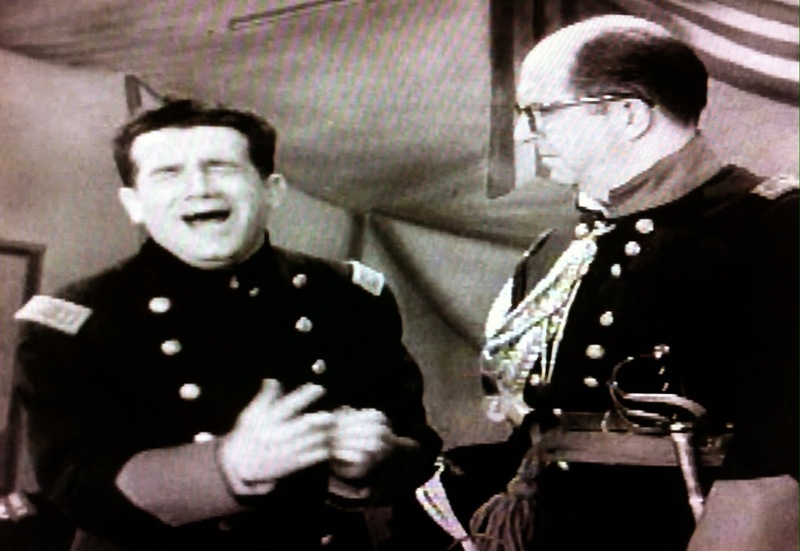 But he's ready for the new first Act's dress rehearsal, and once again, Bilko knows that only one actor should play the central role of Colonel "Honest" John Otis, "in that great moment during the Civil War that made him famous". 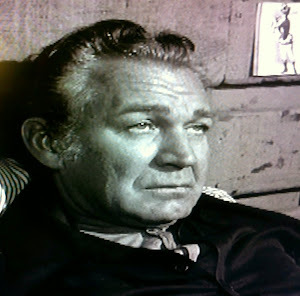 Col. Otis is faced with a decision no man wants to make. His best friend and West Point classmate Major Barton is charged with treason, with overwhelming evidence against him. Friendship and love cannot interfere with duty. "Bring in the prisoner!" 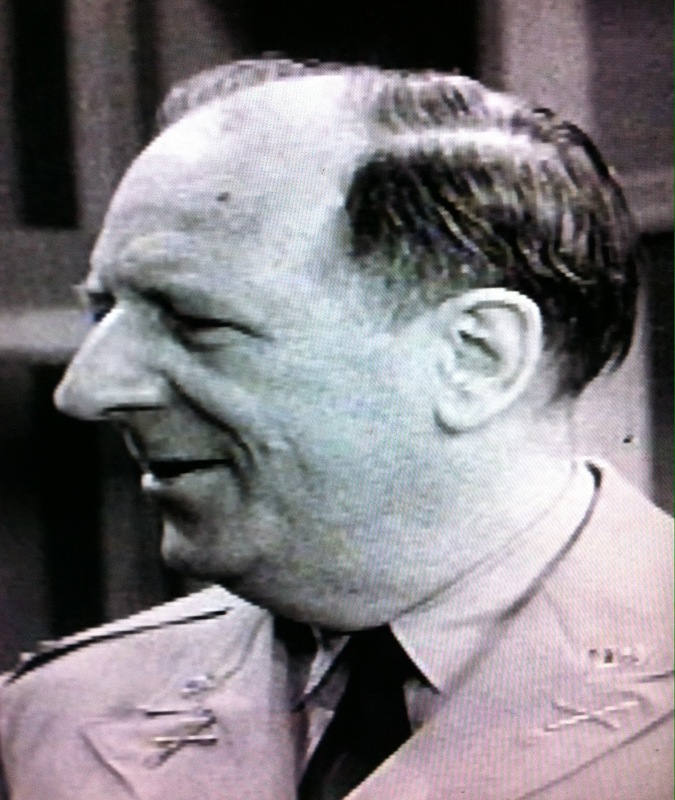 Sands' Private Pappareli gets the key role of Major Henry Barton. His name is on a document "signed by Jefferson Davis, Confederate President", which is the smoking gun. He is condemned to death despite tearfully professing his innocence. 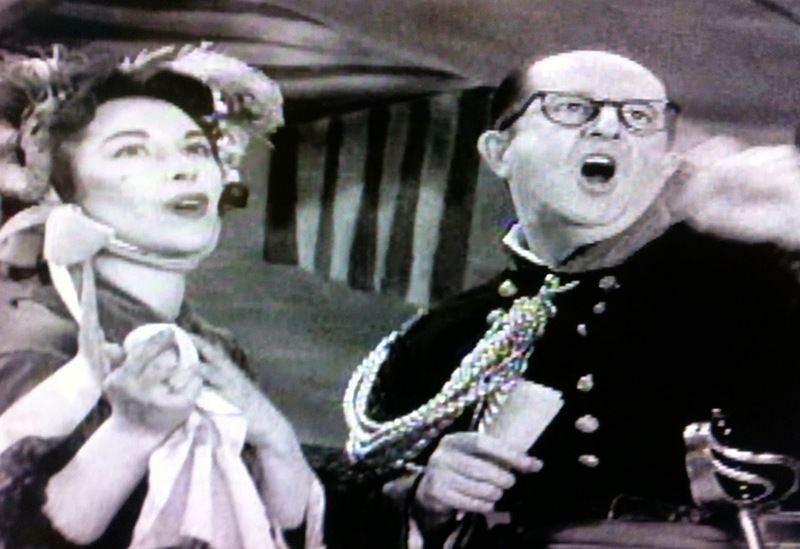 However, cooler heads thankfully prevailed, and casting director Bilko decided on art class model Miss Doozer to play the pivotal role of Mrs. Barton, pleading for her husband's life. "He's innocent! He never saw the paper! He's your best friend, you've known him all your life!" While the prisoner is taken away to be hanged, Mrs. Barton continues pleading his case. Until everyone is gone, that is. "Darling!" Yup, they've been having an affair and they've framed Major Barton by planting the evidence. You would think that's our scene stopper right there, but maybe Parker is in shock, since the scene continues on for some time. Their next plan is to sell General Lee all of the post's guns, and then it's "off to South America with the profits". 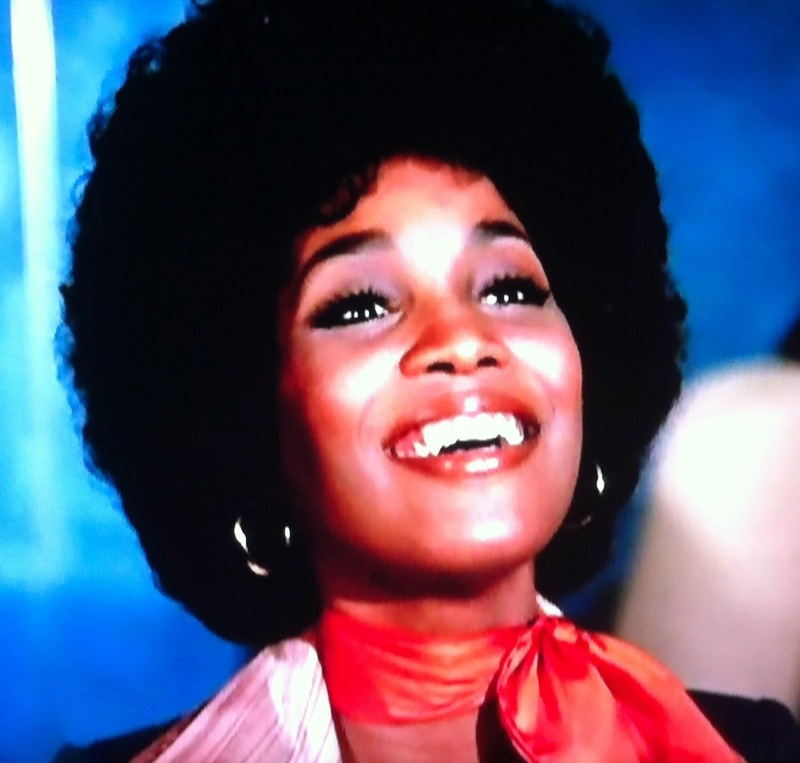 "It was all right---they recaptured Colonel Otis in Nicaragua, he was brought back and hanged!" Nevertheless, Parker has Generals and Senators coming. "This isn't a Centennial, it's a Parade of Corruption!" 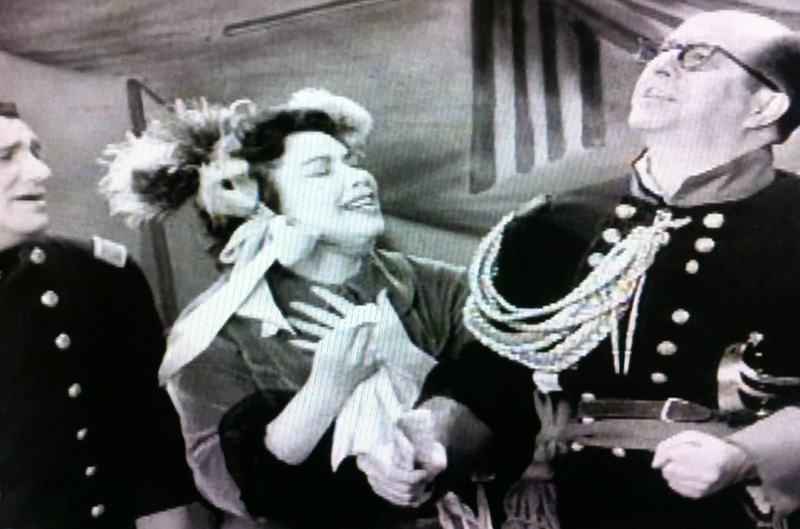 The mere mention of that last word has Bilko bringing up the stirring climax of the next chapter, in which General "Iron Mike" Grundy, great hero of the Spanish-American War, breaks up the Spanish Espionage Ring. Smile, and the world smiles with ya, eh Colonel? 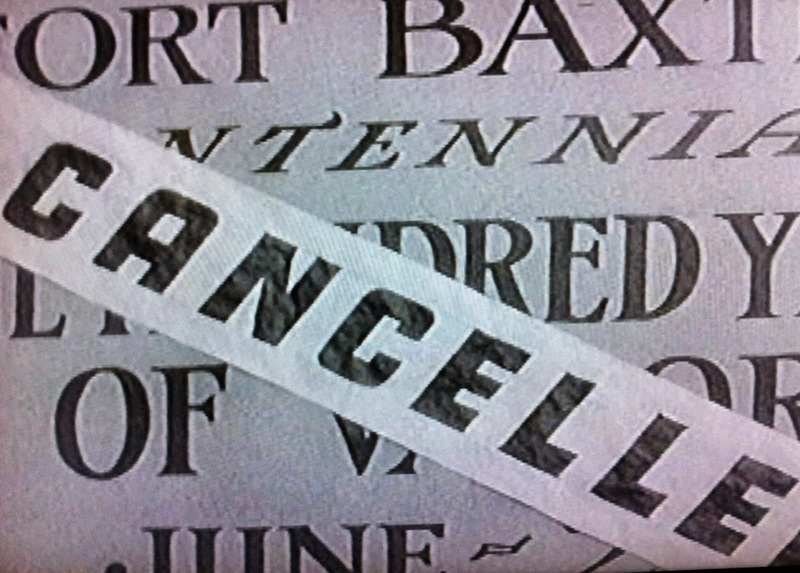 And so, with a little more rewriting and rescheduling, we've now cut the Centennial in half. Truth's lips have still been sealed too long, and having kept them mum about the previous half-century, he takes us to Iron Mike Grundy's headquarters. 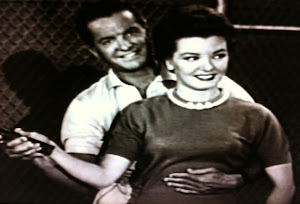 Superspy Mata Lopez has been trading kisses for secrets, but as Iron Mike, Bilko has "the bait" to lure her out of hiding. All those young, inexperienced soldiers have fallen under the lure of the female espionage expert, but she finally has met her match with Iron Mike. And with that, "Iron" Mike melts, and all the secrets are once again in enemy hands. A frantic Parker has a much quicker trigger this time, not only with the scene, but with the Centennial itself. 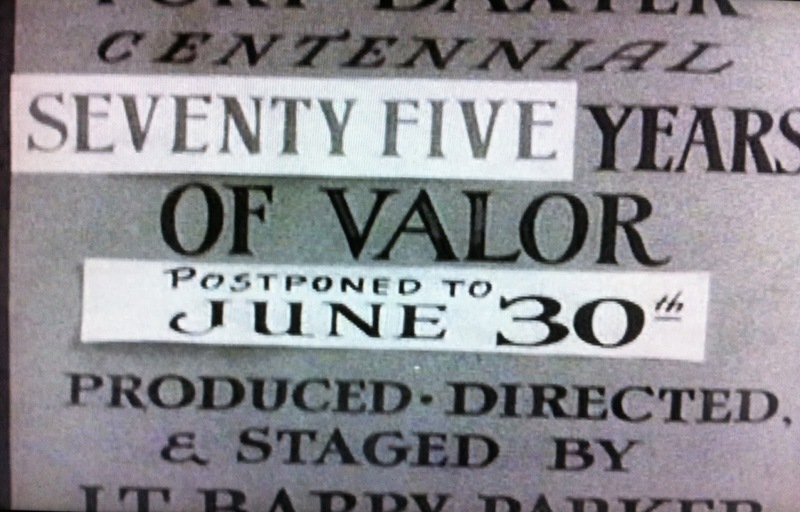 We can only wonder what was going on at the post during World Wars One and Two. 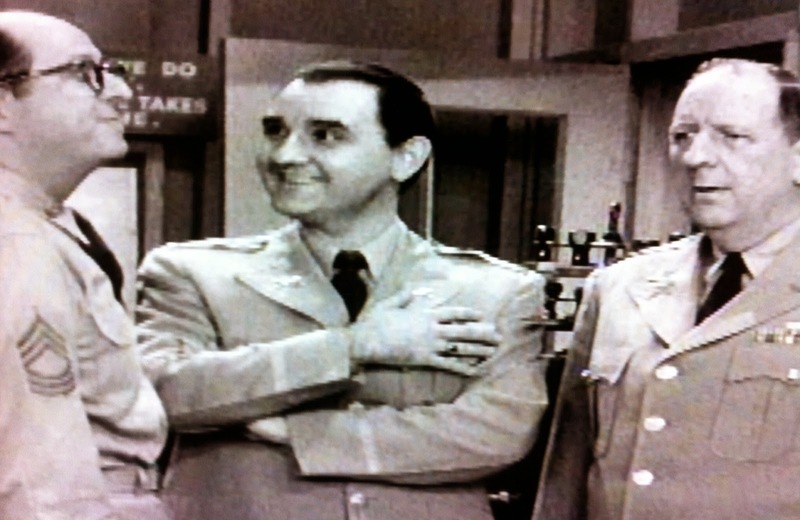 Last side note: it is always fun to check out the constantly changing signs in the background on THE PHIL SILVERS SHOW. 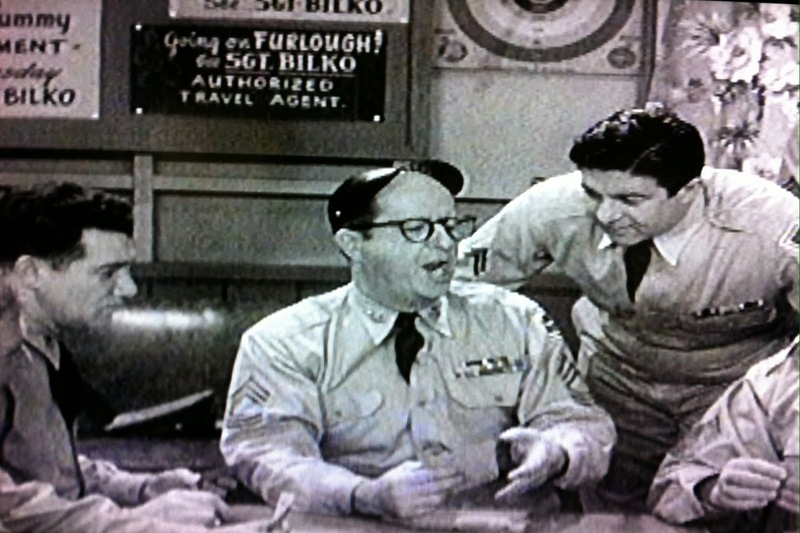 In this scene alone, we can see that Bilko has organized a Wednesday Gin Rummy tournament and is also an "Authorized Travel Agent" for anyone going on furlough! Hopefully Bilko saved all the sets and costumes along with the book this time. 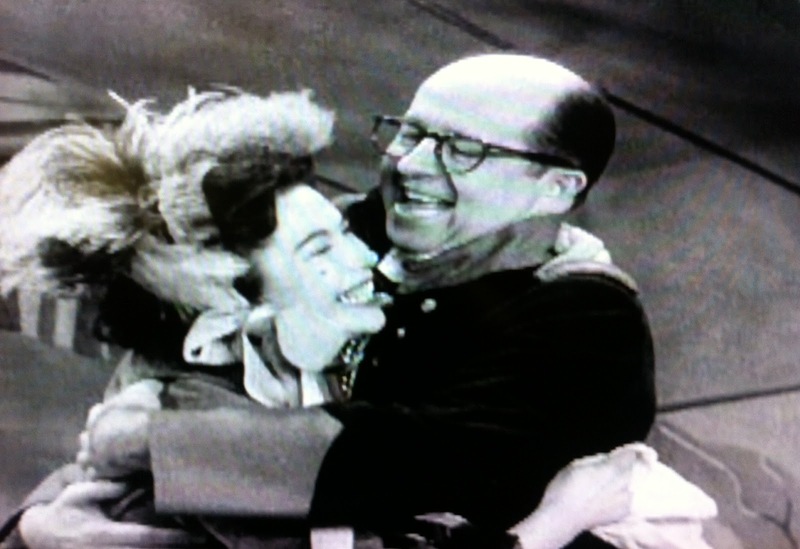 It's a testament to the brilliance of THE PHIL SILVERS SHOW's first season that an episode as side splittingly funny as The Centennial was merely par for the course. Nat Hiken's preference for filming each episode like a live performance really adds extra zing to the "show within a show" sequences, untouched flubs and all. 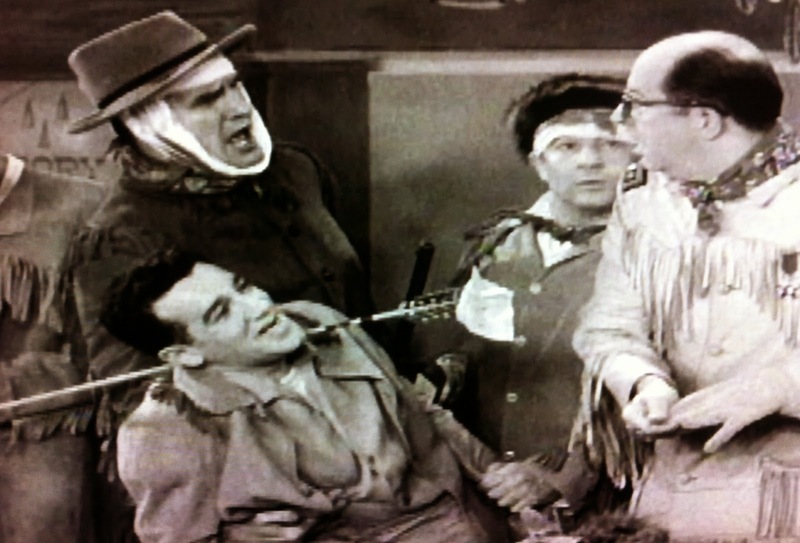 Sergeant Ernest T. Bilko is still easy to root for against the anathema facing him, more so than usual here since he looks positively honest compared to the Fort's past "heroes". 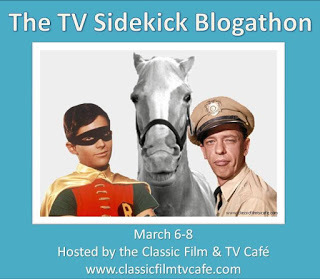 THE PHIL SILVERS SHOW airs every Sunday morning at 3 A.M. and 3:30 A.M. Central Time on MeTV, immediately following an hour of Nat Hiken's other classic, CAR 54, WHERE ARE YOU? Hahahaha. This episode (and this series) is forever funny. 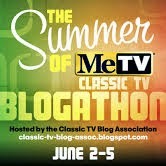 Thanks for reminding me about this show--I'm looking forward to catching it again on MeTV this summer. 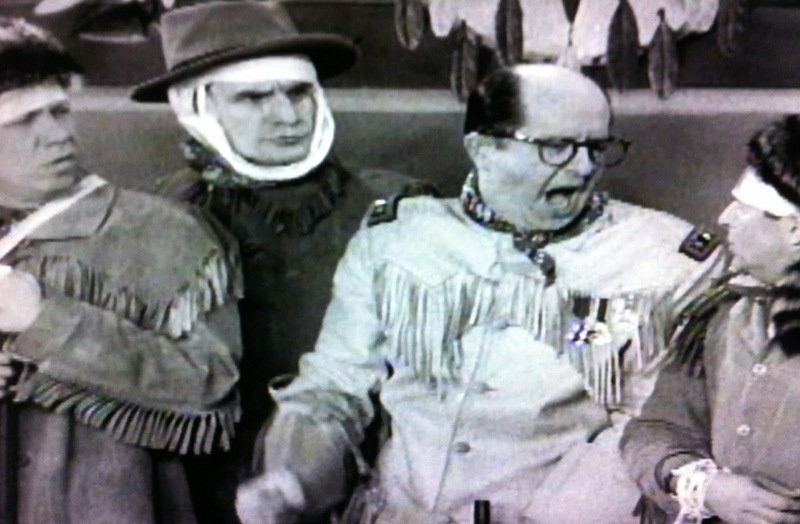 Sometimes Phil Silvers' act wears a little thin, but just when you don't think you can work up any enthusiasm for him, you run across an episode like this, and it makes you forget everything you just said. When this show is on (which is frequently), it's hard to find anything funnier. 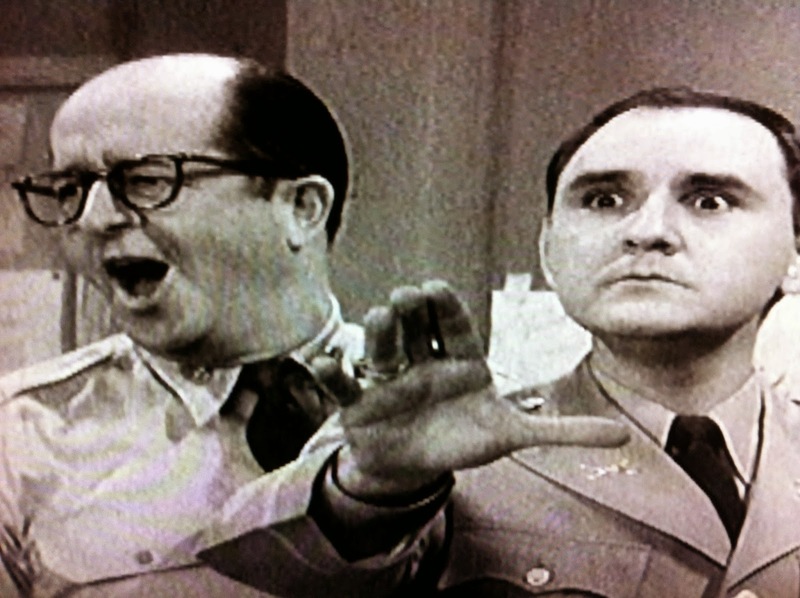 My favorite, as I suppose is the case with many people, is "The Court Martial"; the scene with Bilko defending the monkey in court is truly one of the all-time greats. 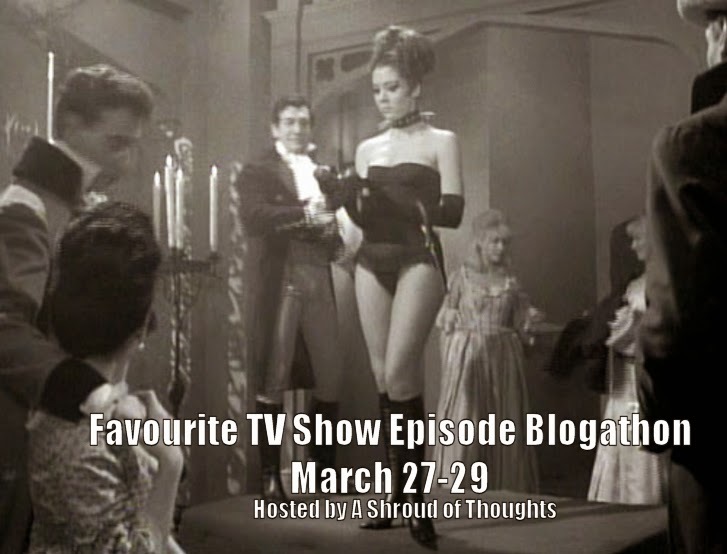 But there are many more - this episode, and the just-recently aired story that featured Mike Todd in an Around-the-World-in-80-days spoof. 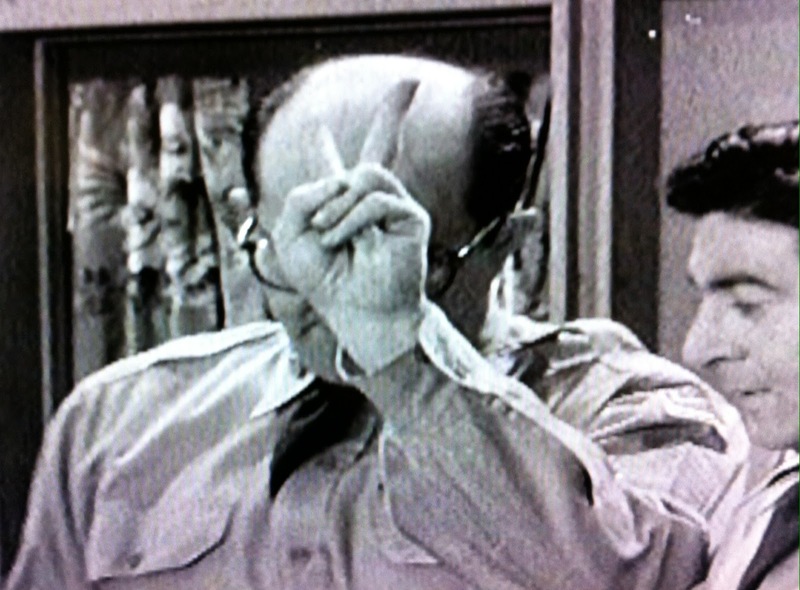 Phil Silvers was a unique talent and it's hard to think of an actor better matched to a TV character (and that's saying a lot). I don't recall this episode, but it sounds like a funny one and some of your pics from it are priceless. A well-done tribute, Hal! 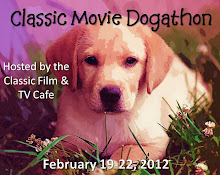 I haven't seen this show since I was a kid! Reading this brought back some memories for me. And Jason Evers! I LOVE him in The Brain that Wouldn't Die. He always reminded me of The Professor!